The rose in the front was designed by Kunihiko Kasahara. The diagrams can be found in his book, Origami New Discovery II, ISBN 9784817080868 (in Japanese). 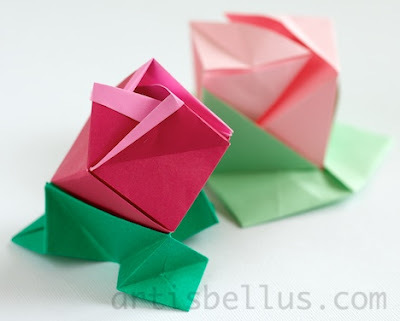 I folded it with two 6" (150 mm) squares, one of duo origami paper (pink and red), and one regular origami paper (green). The rose in the back was designed by Jun Maekawa. 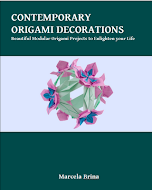 The diagrams can be found in his book, Genuine Origami √2, ISBN 9784817081506 (in Japanese). All the models in this book are folded from rectangles where the ratio of the longer side to the shorter one is √2 ("A series" paper sizes). 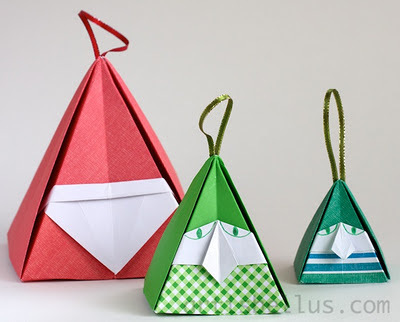 Looking at the models pictured in the covers, it seems that Maekawa's book was recently translated into English and split into two volumes: Genuine Japanese Origami, Book 1: 33 Mathematical Models Based Upon √2 and Genuine Japanese Origami, Book 2: 34 Mathematical Models Based Upon √2 . The cube rose is in Book 2. I folded this rose with two A5 rectangles of paper (148 mm x 210 mm), one pink and the other green. Great Books! Challenging and fun!